The iconic authors of Russian literature are easy to recognize at first sight. It appears however, that not only their phenomenal literary compositions, but also their remarkable appearances resulted from a cultivated, creative process. We outline here some of the most dramatic metamorphoses in Russian literary history. Arriving from a small provincial town near Poltava (today’s Ukraine) to cosmopolitan St. Petersburg, Nikolai Gogol tried at first to follow fashion trends: he sported a short haircut, a stiff collar and made a lot of effort to tie his necktie in the right way. However, he did not have enough money to radically transform his appearance. According to his contemporaries, his suit represented a contrast between dandyism and slovenliness. On top of his head, Gogol had a tuft of hair, but the writer did not like it so he grew long curls. To cap it all, he grew a moustache to hide his nose, of which he was also embarrassed. As the son of a rich, land-owning family, Ivan Turgenev dressed and groomed his face much like other young people of his milieu, while a student at Moscow University. After he graduated, Turgenev spent a lot of time abroad, he achieved literary fame and his reputation began to develop. In the 1840s, Turgenev began growing his hair and kept a small beard. That change as well as his height and a majestic build made him look more and more like a Russian aristocrat, an aspect further enhanced by his writings. His beard also let him hide his weak chin. As time went by, his famous bushy hair acquired a noble grey colour and the image of a “Russian-European” was born once and forever. As an artillery officer in the military Leo Tolstoy followed official orders regarding facial hair. A clean-cut hairstyle and a well-shaven face are standard in the army now, but the appearance of an officer in the Russian Empire was even more regulated. 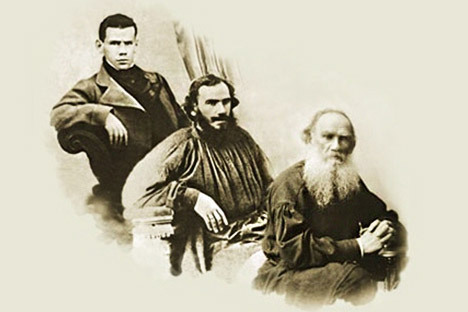 As soon as he resigned his commission, however, Tolstoy began growing out his beard, which has now become one of the most recognizable in Russian culture. Growing your beard to such a length at that time was perceived as a sign of rebellion against government dictates. Tolstoy also changed his wardrobe from the aristocratic attire of a Count to simple clothes of a peasant, which was quite shocking during the epoch in which he lived. As a Nikolayev Military Engineering Institute graduate who was promoted to the rank of a junior officer, Fyodor Dostoyevsky also obeyed an order about shaving. After being arrested for involvement in the Petrashevsky Circle (an underground socialist group) he was condemned to penal servitude. According to terms of his sentence in Siberia, he had to serve as a soldier and then as a non-commissioned officer and had to have his hair length measured with a ruler. After Dostoyevsky received a pardon and came back to the European part of Russia, he took on the look for which he became famous. His hair, to which he often applied pomade and carefully smoothed according to the fashion of the time, was “whitish, extremely thin and starting to disappear from his front.” Just like many other balding men he decided to balance this loss with a beard. The writer dressed with care and was disappointed that his beard began to thin out, which his nieces kept teasing him about. The beard didn’t make him a nobleman or a peasant, but gave him almost evangelical features that depicted suffering, which went well together with the general mood of his works. Dostoyevsky also had different eye colours at one time; having injured one eye during an epileptic seizure, he treated it with atropine, which made one eye black while the other one stayed brown. Before the revolution of 1917, the noble and snobbish Ivan Bunin had managed to get into the literary circles of the Silver Age, was awarded two Pushkin Prizes and achieved the status of honorary academician. Women loved him and he loved them back. In photographs from those years he looks like a fop with his imperial beard, dandified moustache and elegant suit. The 1920s became a critical time not only for Russia but also for other countries that had been involved in World War I. The Belle Epoque, a time of languishing ladies in corsets and elegant cavaliers with imperial beards, had ended. The Roaring Twenties began and it became fashionable for men to shave their faces often. The émigré writer stayed abroad and yielded to the general trends, which worked to his advantage. Old-fashioned facial hair had hidden his regular features, but once he shaved we see a strong man’s face, which corresponds to his prose.